This traditional styled accent piece will garnish homes with a den-room aura providing a sophisticated look of luxury and charm. 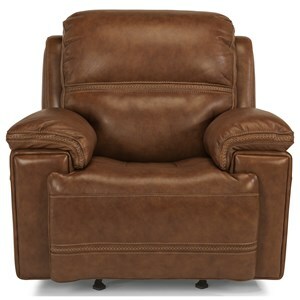 Unlike casual recliners that can often look bulky and too overstuffed, this designer piece features decorative rolled arms with a wing back detail and nail head trim for a classic tailored accent. 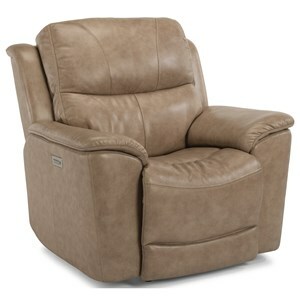 A plush upholstered seat cushion, defined headrest and fully padded chaise add to this recliner's style with a casual feeling comfort while a power recline mechanism provides swift and easy recline with the touch of a button. 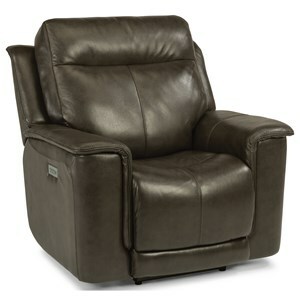 An elegant piece with an unmatched comfort, this recliner is crafted by an elite manufacturer who is known in the industry for providing quality durability. 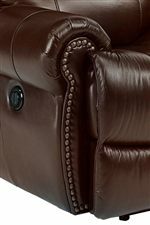 The Latitudes - Capitol Elegant Power Recliner with Nail Head Trim by Flexsteel at Thornton Furniture in the Bowling Green, Alvaton, Glasgow, Scottsville, Franklin area. Product availability may vary. Contact us for the most current availability on this product. The Latitudes - Capitol collection is a great option if you are looking for Traditional furniture in the Bowling Green, Alvaton, Glasgow, Scottsville, Franklin area. Browse other items in the Latitudes - Capitol collection from Thornton Furniture in the Bowling Green, Alvaton, Glasgow, Scottsville, Franklin area.